This oversized pack includes both high-heads and low-heads that are 30% larger than standard Avian-X mallard decoys. These 17-inch birds stand out with a larger footprint that'll turn high-flying greenheads. Ultra-realistic paint schemes combine with the ultimate in paint adhesion and durability for the final word in floating mallard decoys. All Topflight decoys feature an innovative weight-forward swim keel. Simply snap the line through the swim clip to give decoys natural motion on the water. Packaged 2 Low Head Drakes, 1 Low Head Hen, 2 High Head Drakes and 1 High Head Hen per six pack. Built to withstand the most rugged open water conditions, these indestructible decoys will ride out any storm. Core-Loc technology fills each bird with marine-grade foam to 100% capacity. That means there's zero extra space for unwanted water. Stability on the interior plus authentic looks and custom feather detail on the exterior create absolute mallard perfection. The oversized birds improve visibility and place a larger footprint on the water that rides tough currents with smooth, natural movement. 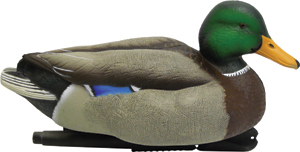 Ultra-realistic paint schemes combine with the ultimate in paint adhesion and durability for the final word in floating mallard decoys. Packaged 2 Low Head Drakes, 1 Low Head Hen, 2 High Head Drakes and 1 High Head Hen per six pack. 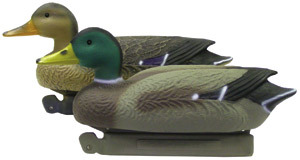 The green heads of these Super Magnum Mallards are molded in metallic green material for permanent color. Custom manufactured in the U.S.A. using domestic flyway body styles. Molded, high-impact plastic for lightweight durability. Specially treated surface for maximum paint adhesion and longevity. Unique keel design with front and rear tie off. Anchor line adjustment hook. Keel's weight and counter balance guarantee self-righting. Authentically hand-painted with natural bird colors for exceptional realism. Non-glare paint. Raised feather detail and realistic acrylic eyes. The size of these decoys make them hard to miss on the water. The green heads on the Super Magnum Mallard are molded in metallic green material for permanent color. Custom manufactured in the U.S.A. using domestic flyway body styles. Molded, high-impact plastic for lightweight durability. Specially treated surface for maximum paint adhesion and longevity. Unique keel design with front and rear tie off. Anchor line adjustment hook. Keel's weight and counter balance guarantee self-righting. Authentically hand-painted with natural bird colors for exceptional realism. Non-glare paint. Raised feather detail and realistic acrylic eyes. 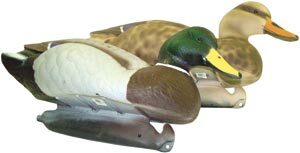 The size of these decoys make them hard to miss on the water. There not a lot to say about this decoy but Wow, these decoys are huge in size and what a statement they make on the water. Both the Drake and the Hen decoy measure 25" from bill to tail. If the ducks do not see this decoy on the water they must be blind. Packaged 2 drakes and 1 hen per 3 pack.